Charlotte/USA. 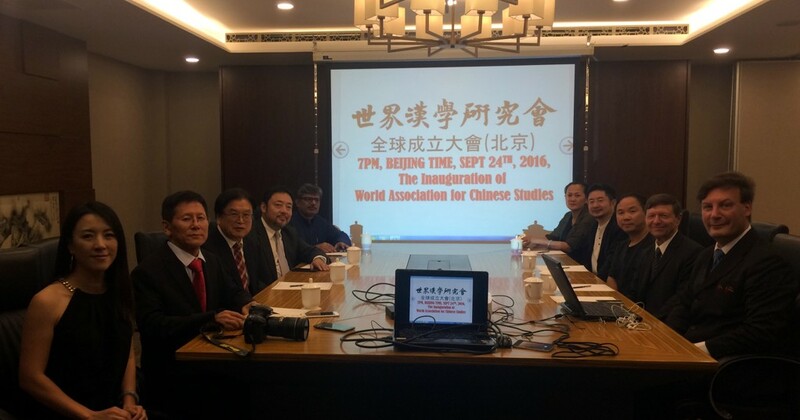 The World Association for Chinese Studies (WACS) was founded in an Inaugural Ceremony in an online Ceremony attended online by representatives from 36 countries. CHARLOTTE, N.C. - Sept. 25, 2016 - PRLog -- As a US-registered organization with the famous scholar and liberal former PRC vice minister Hu Deping as its Honorary Chairman, as well as famous Harvard scholar Stephen Owen and French Léon Vandermeersch as Vice Chairmen, it keeps the balance between the necessary support from and cooperation with China, which is its object and field of study, on the one hand, and the independency necessary to carry out critical research on an international level on the other hand. The Director General Zhai Mu (aka Wang Hong) from Jilin University explains why the Association did not use Chinese terms like [Zhong]guoxue (Sinology) for its name: "Chinese studies is carried out all over the world, it is not just a Chinese thing any more and our Association will be internationally oriented." Actually, the Executive Board lists Korean Jae Woo Park and German Martin Woesler as members. WACS has been registered in August 2016 as a non-profit Association in the USA and establishes in its Bylaws the freedom and independence of research and teaching as a core principle. The Ceremony was attended by 163 representatives from 36 countries, live broadcasted on the WhatsApp comparable chat service "WeChat" and covered by the Chinese Television CCTV. Since 2003, the Chinese government through its 'Han'-Office sponsors the export of Chinese culture and language with Confucius Institutes, with sponsorship of Meetings like one of the European Association of Chinese Studies, with scholarships and since recently with the Great Congress of Chinese Studies held annually in Beijing. All of these government-sponsored initiatives are questioned regarding its independency. WACS now puts independency top, specifically rejecting any ideological or political influence. However, as symbolized in its emblem "peace", it is a purely academic association and does neither seek confrontation nor pocketing. WACS also wants to help combine the efforts of national Associations of Chinese Studies by establishing a longterm-oriented umbrella Association, offering institutional membership to all existing associations in the field and striving for strategic partnerships with established organizations like the Association of Asian Studies and others. Among the Vice Directors there are US based Edward L. Shaughnessy and Shang Wei as well as French Antoine Gournay. The list of directors from Western countries contains famous sinologists like Helwig Schmidt-Glintzer, Louise P. Edwards, Kam Louie, Oldřich Král and Marián Gálik.